From an Owner's Eye: I'm Happy to Be Alive! Home › Running Tips › From an Owner's Eye: I'm Happy to Be Alive! “I’m Happy to be Alive”, says John Burke, 92 years young. Race season is upon us with many working towards 5Ks, Half Marathon, Full Marathons even triathlons or duathlons. “I’m Happy to be Alive”, says John Burke, 92 years young. Words said to me by John Burke this past weekend at a 5K I ran in. John Burke finished the 5K just under 57 minutes with a huge smile and turning to our YellowJacket Racing crew upon completion, “I’m 92 years old”. Ninety Two Years Old. Process that for a moment. How many of us know people who are over 90, let alone over 90 that are still participating in 5Ks. Process that for a moment…..which I did and immediately sought to find John so I could have a picture with him. I found him sitting on a ledge recovering from his 5K. I approached and while our exchange was brief it was powerful. I asked if I could have a picture with him. He was happy to oblige, and continued to tell me that he was a World War II Veteran. My eyes widened as recently I’ve been on a reading binge of WWII historical fiction novels, telling tales of the atrocities for those fighting and living in war torn countries during WWII. I asked where he was, where he replied South Pacific in Okinawa. My mouth gaping simply thinking what he may have seen and experienced. I asked what years, he replied 1944/1945. 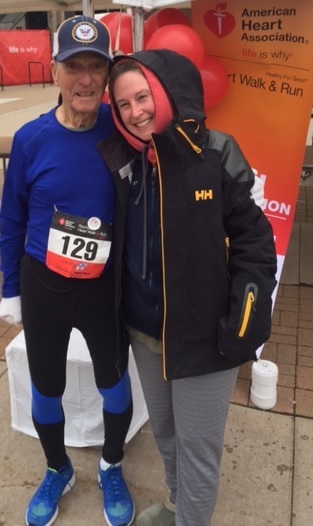 Quick math has this now 92 year old man, just finishing a 5K, sharing with me that he was in WWII at just 19 years old. Nineteen Years Old. Not knowing exactly sure what to say, I could only muster, “Thank YOU!”. At which John replied, “I’m Happy to be Alive!”. Process that for a moment…..because I still am. In this short exchange I have no idea if in John’s 92 years, he experienced anything worse than being a 19 year old in World War II. I can only surmise. But I can say he is so proud to be a war veteran. So proud to be 92 and in a 5K. And, so proud to be alive. What is my point? These coming weeks athletes will be testing themselves in their events, no matter what distance or specific event they are in. Athletes are going to have all kind of back stories, trials and tribulations that got them to the start line, just like John. But my hope for you during these events is that when you cross that finish line you can enjoy the journey to get there and one of the phrases you can say is “I’m Happy to be Alive”, just like John.